The computer labs on the ground floor of the Computer Science and Information Technology Building (CSIT) at the Australian National University are due to be re-equipped. Rather than just replace the old computers with new ones, I have suggested turning part of the ground floor (about 300 square metres) into a teaching and learning commons, modelled on a military Decision Support Centre. As well as regular teaching, this would be used to expose senior public servants from the Australian Public Service and senior military officers, to new technology supported decision making techniques. This would be done in much the same way that the the University of Canberra Inspire Centre is used to allow teachers new technology based educational techniques. Also the facility would showcase the latest in low energy technology. Apart from the environmental benefits such energy saving technology saves lives in military operations by reducing the logistics tail and so putting fewer support personnel in harm's way. The changes in teaching practice are also reflected more widely in organisations (including the public service and the military), with the regimented approach of "offices" and "meeting" breaking down. A change in the physical design will better prepare students for the world in which they will work. The ANU Research School of Computer Science is a leader in the development of open source software and operating systems. ANU uses a mix of operating systems. There are also new options with students using their own laptops, net books and tablet computers. The use of "cloud" computing and web based interfaces is rendering the issues of the desktop hardware and operating system used to be largely irrelevant. Students, increasingly have their own mobile computing device, be it a laptop or tablet. The university needs to provide wireless networking to the learning management system and major computing resources. This approach is now reflected in business and government with increasing use of Bring-Your-Own-Device (BYOD). As a result the University will require fewer large lecture theatres seating hundreds of students and more small computer equipped flexible teaching rooms seating 24 to 48 students. Also space will be required for students to work alone or in small groups with computer access. This creates an opportunity to skip generations of high cost specialised classroom design and adopt a general purpose open plan layout in the CIST building. 1. Cafe Reception: The existing foyer would be equipped as an informal "cafe" with tables and benches with power points for student laptops. Some spaces would be equipped with wall mounted screens for small group work by students. These could be modelled on the UNSW Eora Exchange (by lahznimmo architects) and the Southbank Institute of Technology Library. Other useful examples are the University of Canberra Teaching and Learning Commons, ANU Hancock West, and University of Adelaide Hub Central. 2. TEAL Room: The internal walls would be removed from the western end of the ground floor to create one large square 18 x 18 m "TEAL" room, like that at the University of Canberra Inspire Centre. This would accommodate classes of up to 120 people. The room could be divided into four smaller rooms with movable partitions. 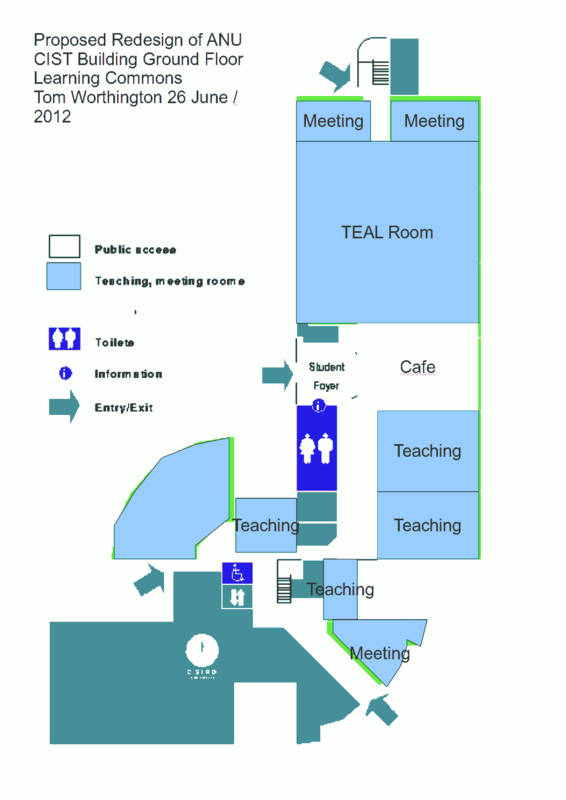 To accommodate computer based examinations, then the TEAL room would be lined with metal foil insulation, blocking external wireless data access. Students could use their own laptop, a specially filtered WiFi system and a monitored, hosted IT system for their examinations. Students would only be permitted to use their laptops as terminals to the examination server, with any data copied from elsewhere detected and reported by the system. The same system would be available for classes made up of senior public servants and military officers, where sensitive topics may be discussed. 3. Decision Support: The TEAL room would have a flat floor with a rubber surface making it suitable for movable wheeled furniture. The walls would be plain white-board surfaces and equipped with projectors. This would allow the room to be laid out with movable furniture to emulate a civilian office, or a military command centre. Additional support software would be hosted locally, or accessed from a remote server, such as the Grouputer system. Students would interact with scenarios prepared, including live and simulated content transmitted to the room. Such systems are discussed in "Electronic meeting systems – what they are and how they could benefit Australian government organisations" (S. Lesley Hodges , 2010).